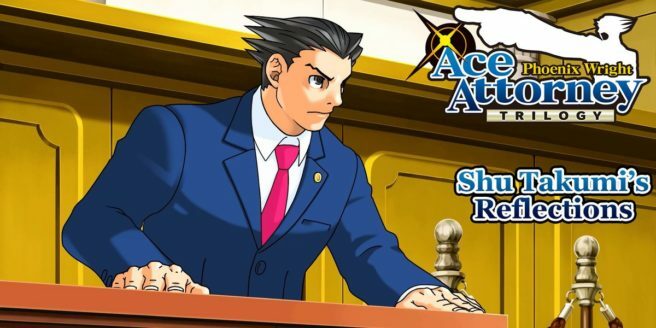 Earlier today, Capcom put up a new blog post straight from Ace Attorney creator Shu Takumi. Takumi discussed bringing the series to new platforms (including Switch) and reflected on those original games he worked on. Hello. This is Shu Takumi, the original planner, scenario writer, and director of the first three Ace Attorney games. The first Ace Attorney game made its overseas debut in 2005, but it was originally released in Japan in 2001. So, as we approach the series’ 20th anniversary, I was surprised to hear that we would be releasing this latest version with redrawn graphics and a more refined UI. I was doubly surprised to hear that the series would be taking its first steps away from Nintendo handhelds to make its global multi-platform debut on the Nintendo Switch, PlayStation 4, Xbox One, and PC. While I left the actual work of porting the game to the dev team, when they showed me the final game on a large TV, I was surprised yet again by how fresh everything felt thanks to all the little details they had restored. When I had set out to write the first game’s script, I had wanted to make it something people could play in 10 years’ time and still feel that it was as relevant then as when I’d written it. Therefore, I avoided things that would date it like using popular slang phrases or building stories around current affairs, and instead, focused on stories that anyone can easily relate to and understand… And now, here we are 18 years later. What started as the creation of a small, seven-member team has grown into a series that people all around the world can enjoy. As a creator, that fact in itself is a great source of joy for me. I am grateful for everyone’s love and support. The idea to make a game about a lawyer fighting in a court of law first took shape in a game proposal doc I wrote in the summer of 2000. There were no courtroom-based games at the time, so it was very hard to convey to others what it would actually play like. When I first presented the game’s concept to the higher ups in the company, I received a lot of negative comments like, “This game seems hard and unforgiving. Are you sure players will take to this?” and “Won’t players need some legal knowledge just to play?” But the point of the game wasn’t “the law” or even “reality”. Instead, I imagined a game where the point was to have fun solving puzzles and enjoy the excitement of calling witnesses out in their lies with evidence. I imagined the courtroom to be like a huge colosseum where the crowds above would loudly cheer on the verbal gladiators below. That’s why I took the negative comments to heart and used them to help me decide how to create the game’s characters. I aimed to create characters that seemed to sit on the line between “real” and “not real” – ordinary enough to exist in the real world while being just outlandish enough not to. I wanted them to be funny and charming so as to leave an impression on players from just a single glance. For main characters like Phoenix and Edgeworth, I decided to give them each a unique and recognizable silhouette and color scheme. As for the witnesses, I wanted them to change dramatically over time and to reveal their real colors the more you pursued them. That drastic difference in tone was something we wanted to really stress when we were designing them. The first of these characters that we created was April May. I’m willing to bet that there isn’t anyone on Earth who didn’t feel a huge sense of satisfaction when they finally took her down. From the second game onwards, I decided to take the character designs in a new direction. In the first game, the characters were meant to be “real but not real”, but with the second game, we made them “100% out of this world”. One character that represents this to a T is the whip-loving Franziska von Karma. Her impossibly indiscriminate whip strikes down witnesses, lawyers, and even judges alike in court. Yet, despite all that, not a single person on the team told me it was a totally ridiculous idea when I first proposed it. So, while the first Ace Attorney had laid the groundwork, we kept taking things further and further until one day, a coffee-loving masked prosecutor named Godot appeared. Back when we were creating these characters, we thought it was vital that we found the characters to be funny ourselves, and that we had as much fun as possible while making them. We believed that if we created them in joy, then players would surely interact with them in joy as well. The fact that the characters we created are still yelling “Objection!” somewhere in the world to this very day… as a creator, it is the greatest honor I could ever have.